BrianSplode! 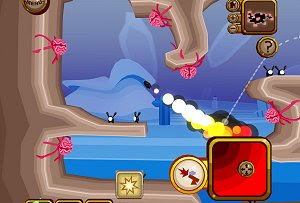 is a game of wits and skill where the player has to destroy some alien brains in a similar way to Worms. However, this time you’re controlling a fixed canon and have to calculate the rocket trajectory perfectly in this freeware game. Although we cannot move, there are yellow pads in the levels to make the rocket rebound, along with a few powers to alter the rocket trajectory. This is a simple and fun game.